We’ll be appearing at The 13th Cathedral Quarter Arts Festival in Belfast. More details and tickets can be found here. We have rescheduled our Palladium gig from 28th May for 25th June. Tickets for the original date are still valid of course. We’re headlining the main stage – buy tickets here. Deer Shed Festival = the vibe of a lazy Sunday afternoon in the perfect pub beer garden, sound-tracked by a bill that resembles the 6 Music playlist. Shortlisted for the Best Family-Festival at the UK Festival Awards 2011, this is an independent festival run by a family for the family. The Deer Shed Festival team book bands they love, work with like-minded people, keep it chilled, don’t squeeze a thousand tents into a field the size of a postage stamp and don’t charge a fortune. Good old-fashioned hospitality and great bands. The first show for Saint Etienne in Switzerland since the late 90′s. Not to be missed! On stage at 10.30pm. Saint Etienne will be headlining the London Live event in Hyde Park on Saturday 4th August 2012. Entry to the park and the activities there is free but we would advise applying for guaranteed entry tickets in advance as entry on the day is on a first come first served basis. Saint Etienne will be on the main stage at 10pm and Olympic events can be viewed between bands on huge screens around the park all day. Please check for details here. Oslo is a favourite for Saint Etienne so we’re over the moon to be playing Oya this year. Catch us at Parkteatret at 11.30pm. Saint Etienne take the main stage at Flow Festival in Helsinki at 9pm. This is Finland’s best festival so not to be missed. Saint Etienne’s first appearance at Frequency Festival which takes place in St Polten near Vienna. The band will be doing a signing at 3.30pm in the Volume tent before appearing on the Green Stage at 5.45pm. When our good friend Ross Millard from the Futureheads asked us to play at his festival in Sunderland, how could we say no. We’ve heard only good things about this event and are really looking forward to it. More info at the official site here and buy tickets here. We’re going to Turkey to play at Salon IKSV – full details are here. Our Spanish tour continues with a trip to Vigo. Our Spanish tour conntinues along the north coast so San Sebastian/Donosita. The last leg of our Spanish tour visits Mercia. We’re doing a few more shows in the UK again just before Christmas, stopping off in York where we didn’t get a chance to visit in May. We’re also pleased to announce some VERY special guests in the form of Scritti Politti – proper heroes of ours – who will be opening up for us. We’re doing a few more shows in the UK again just before Christmas, stopping off in Edinburgh where we didn’t get a chance to visit in May. We’re doing a few more shows in the UK again just before Christmas, stopping off in Manchester where we didn’t get a chance to visit in May. We’re doing a few more shows in the UK again just before Christmas, stopping off in Brighton where we didn’t get a chance to visit in May. We’re doing a few more shows in the UK again just before Christmas. We’re taking our first trip to Japan since we can remember and we’re very excited so we hope to see you there. 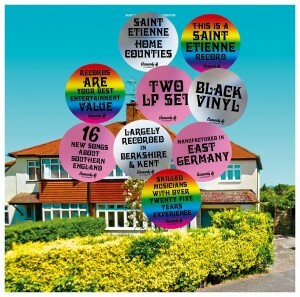 Words and Music by Saint Etienne has been nominated for Best Pop Album of 2012 at the South Bank Sky Arts Awards. The Awards ceremony is on Sky Arts 1 on 14th March at 9.30pm. We’re up against Plan B and Jessie Ware so be sure to tune in and cheer us on. Join us at the Hackney Picture House in London for a special 10th anniversary screening of Finisterre on April the 4th. Tickets are available online now for Picturhouse members here. Non members will need to call to reserve tickets at 08717042068 quoting the password ‘Heavenly Films Night’. Finisterre is a beautifully shot and edited homage to London, soundtracked by songs from the band’s album of the same name. Directed by Paul Kelly and Kieran Evans in collaboration with Saint Etienne the film explores the attraction of the city through interviews with artists, musicians and kindred spirits that have inspired the band over the years. The one hour film premiered at the onedotzero film festival in 2003 and will be re-issued later this summer by the BFI as part of a Saint Etienne London trilogy film set. The evening starts at 8pm, the film will be accompanied by the rarely screened trio of films about London’s disappearing cafes – Today’s Special, the premiere of a new short Banksy’s London and two Q&A sessions: one with Bob, Pete and Sarah, another with Paul Kelly & Kieran Evans. Afterwards from 10.30 to midnight Bob and Pete will be Djing in the bar. Should be a great night, tickets are limited so book soon to avoid missing out. WHERE: Cantor Film Center, 35 East 8th Street (between Greene Street and University Place). Over the last decade, Paul Kelly – already well known as a musician (as a member of the much-revered East Village) and graphic designer – has forged a reputation as one of the most distinctive British documentarians of his generation. Refining an unusually lyrical brand of psychogeography informed by pop-modernist aesthetics, he moves between the city symphony, film essay and companionate portraiture to fashion beautifully composed and deeply atmospheric evocations of overlooked places and individuals. Whether working in collaboration with the band Saint Etienne on a lushly ambient trilogy about London, or in his witty and empathetic films about the much-beloved Dolly Mixture and Lawrence of Felt, Kelly’s films are immediately recognizable and immediately lovable. Nothing’s Too Good For The Common People is the first retrospective of this key filmmaker’s work to have been held anywhere. Organised by the New York-based Colloquium for Unpopular Culture (Kiss Me Again: The Life and Legacy of Arthur Russell; Leaving The Factory: Wang Bing’s Tie Xi Qu; A Cathode Ray Séance: The Haunted Worlds of Nigel Kneale) in collaboration with Chickfactor magazine, it will feature the US premieres of many films, introductions by a constellation of artists and musicians, and Paul Kelly himself in discussion with the director and writer Bilge Ebiri. To mark Nothing’s Too Good For The Common People, there will be available for sale copies of a very limited-edition book designed by Rob Carmichael (John Cale, LCD Soundsystem, Animal Collective’s ‘Crack Box’) and featuring contributions by a wide range of writers, musicians and architectural historians including Jon Dale, Travis Elborough, Alistair Fitchett, Dan Fox, Joe Kerr, Stephin Merritt, Jude Rogers, and Peter Terzian. We are holding a launch event for A London Trilogy DVD at Rough Trade East on Friday 12th July from 6.30pm where we will be screening a selection of short films from the DVD. Bob, Pete and Sarah plus director Paul Kelly will be in conversation with Luke Turner from the Quietus. Admission is free and the DVD – with postcard set – will be on sale. Director Paul Kelly’s elegant and evocative film about the UK’s capital. Narrated by Ian McShane, the film uses coloured archive footage from the 1950s through to the 1980s to portray the ‘New Elizabethan’ age – from the optimistic post-war era to the dawn of Thatcherism. A striking and rousing look at a city that is constantly changing whilst staying the same at its core. 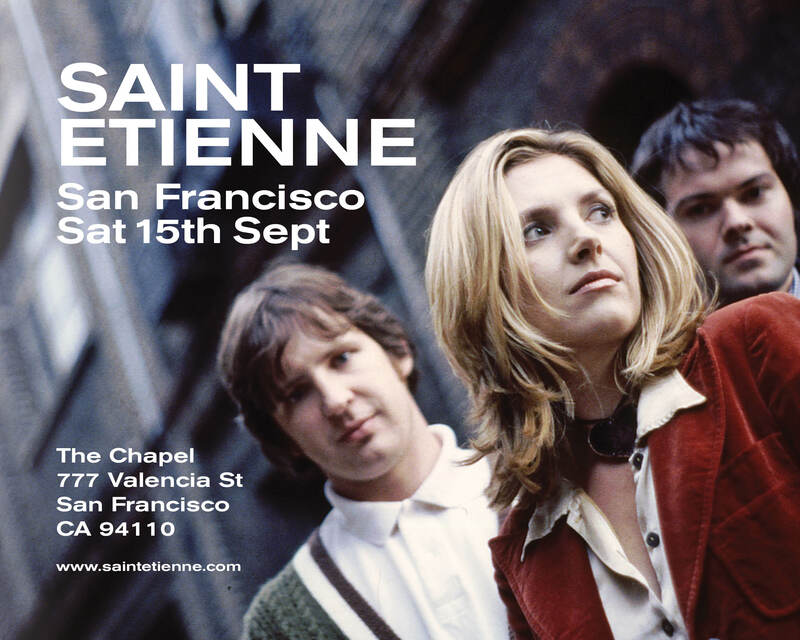 Saint Etienne will also play an extra set of their hits alongside brand new songs in this special Scottish premiere event. 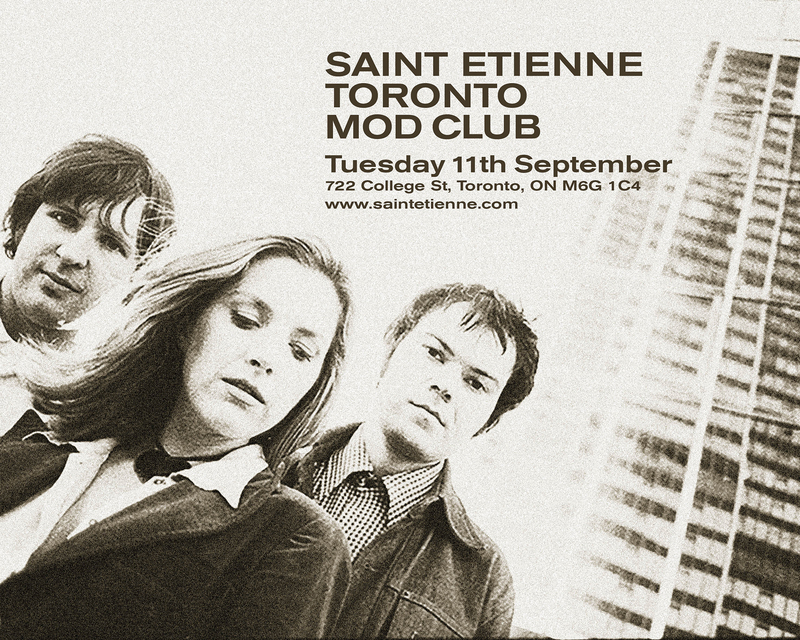 Saint Etienne will also play an extra set of their hits alongside brand new songs in this special event. Sarah releases her brand new solo album in June and to mark the occasion she is heading out on an intimate tour around the UK. Support is from Sea Of Bees. Saint Etienne will be performing their classic Foxbase Alpha album at this year’s End Of The Road festival. Saint Etienne are popping across the Irish Channel to play their classic album Foxbase Alpha in it’s entirety at the National Concert Hall in Dublin. Following the release of Red Kite, Sarah Cracknell is taking her solo show on the road once again. Bob, Pete and Sarah will be joined onstage by the lovely Debsey and the lively Gerard Johnson with added instrumentation from Joe, Robin and Louisa who played with us on the How We Used To Live shows. Expect a set of Etienne classics (some not played for a long time), festive favourites and even a new song or two. Our handpicked support comes from Kero Kero Bonito and The Pre New with DJ sets from the likes of Pete Paphides til 2am at the Xmas after party (in the foyer). Screening of How We Used To Live, followed by a Q&A with director Paul Kelly and writer/author Travis Elborough hosted by author Cathi Unsworth. 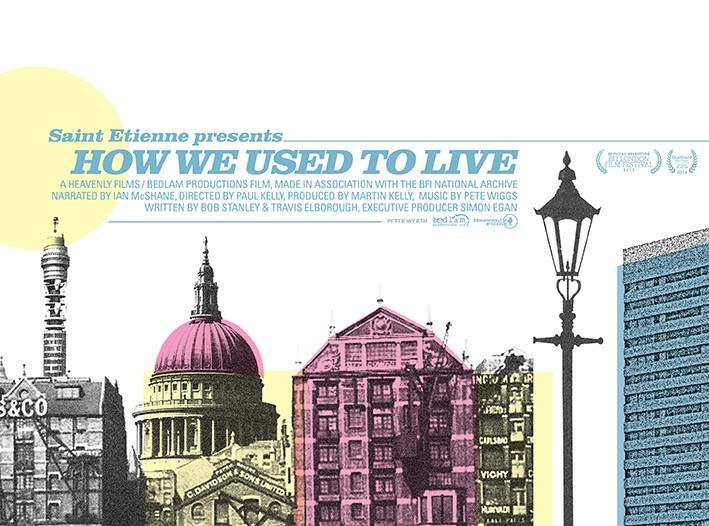 How We Used To Live is a unique celebration of post-war London by acclaimed director Paul Kelly, created through a compelling use of rare footage drawn from the BFI National Archive. With a narration by Ian McShane and an original score composed by Saint Etienne, How We Used To Live is alluringly impressionistic, poetical and political. Perhaps the most joyful, creative and entertaining offering to come from this unique film making collective. The stark beauty of Shetland in winter provides the perfect backdrop for a couple in search of reconnection. Soundtracked by Skylark and the Scorpion (aka Nick J. Webb and Petra Jean Phillipson). Screening of Asunder, followed by a Q&A with director Esther Johnson and writer/producer Bob Stanley. A Home Counties warm up show. See Saint Etienne perform songs from the new album, Home Counties. It is with great regret that this show has been postponed to 10th December. Those not wishing to attend to the revised date can seek a full refund from the promotor or ticket outlet where tickets were purchased. Those who are OK to wait for the resceduled show in December pre-existing tickets dated 6th June will still be valid. It’s not possible to go into the reasons for the re-scheduling here. We really wanted to play the show and will be back to do so as part of a short run of shows in December. Thanks to everyone for your understanding. Saint Etienne play the Port Eliot Festival. Saint Etienne play the Greenman festival. Following the release of their brand new album Home Counties, Saint Etienne play a select few dates around Europe during October and November 2017. With a brand new 7 piece band, Saint Etienne will play songs from the new record alongside a selection of hits and album tracks from their illustrious back catalogue. This show offers a rare chance to see Saint Etienne playing in Denmark. Not to be missed!! Following the release of their brand new album Home Counties, Saint Etienne play a select few dates around Europe during October and November 2017. With a brand new 7 piece band, Saint Etienne will play songs from the new record alongside a selection of hits and album tracks from their illustrious back catalogue. This show offers a rare chance to see Saint Etienne playing in Sweden. Not to be missed!! Following the release of their brand new album Home Counties, Saint Etienne play a select few dates around Europe during October and November 2017. With a brand new 7 piece band, Saint Etienne will play songs from the new record alongside a selection of hits and album tracks from their illustrious back catalogue. This show offers a rare chance to see Saint Etienne playing in Finland. Not to be missed!! Following the release of their brand new album Home Counties, Saint Etienne play a select few dates around Europe during October and November 2017. With a brand new 7 piece band, Saint Etienne will play songs from the new record alongside a selection of hits and album tracks from their illustrious back catalogue. This show offers a rare chance to see Saint Etienne playing in Germany. Not to be missed!! Following the release of their brand new album Home Counties, Saint Etienne play a select few dates around Europe during October and November 2017. With a brand new 7 piece band, Saint Etienne will play songs from the new record alongside a selection of hits and album tracks from their illustrious back catalogue. This show offers a rare chance to see Saint Etienne playing in Spain. Not to be missed!! We regret that due to local issues beyond our control the show at Barcelona Razzmatazz has been cancelled. Full ticket refunds are available at point of purchase. We’re really sorry about this – we hope to be back in Barcelona very soon. We’re excited to be playing the Holmfirth Picturedrome again. If you don’t know the venue it’s one of the best to be found in Yorkshire. Situated within easy reach of Huddersfield (6 miles), Halifax (16 miles), Sheffield (21 miles) and Leeds (23 miles), it’s a great, intimate arts space. We’ll be playing a section of songs from Home Counties plus some hits, some misses and some festive favourites. Not to be missed!! Glasgow is a favourite city of ours to play, especially in the run up to Christmas. We’ll be bringing you news soon of a special support act and we think this Friday night show is going to be a lot of fun. Expect new songs from Home Counties plus some hits, some misses and some festive favourites. Tonight we’re gonna rock it. We love playing in Manchester and The Ritz at Christmas time is always special. We’ll be playing songs from ‘Home Counties’ plus a selection of classic Etienne faves. Bring your Saturday night dancing shoes, festive fun is guaranteed! It’s been a long time since we rocked out in Bristol but this December we’ll be doing just that. We’re visiting a selection of cities around the UK that we didn’t manage to play back in June as part of our 2017 Christmas run. We’ll be playing songs from ‘Home Counties’ plus a selection of Saint Etienne faves. Festive fun is guaranteed!! Saint Etienne shows at the Shepherds Bush Empire are always special and this will be no exception. We’ll be playing a section of songs from Home Counties plus some hits, some misses and some festive favourites. News soon of a special support act too. Get your Saturday night party boots ready!! We’ve always wanted to play the De La Warr Pavilion in Bexhill. With it’s modernistic 1930s architecture it’s one of the most iconic buildings on the south coast. 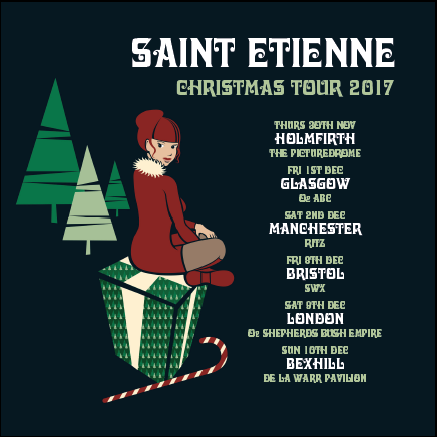 Situated just 5 miles from Hastings and 30 miles from Brighton and right on the beach at Bexhill-On-Sea it’s the perfect place the while away a pre-Christmas Sunday with Saint Etienne. We’ll be playing songs from ‘Home Counties’ plus a selection of hits and album tracks. This is a rescheduled show from 6th of June and all tickets from the earlier date are valid. 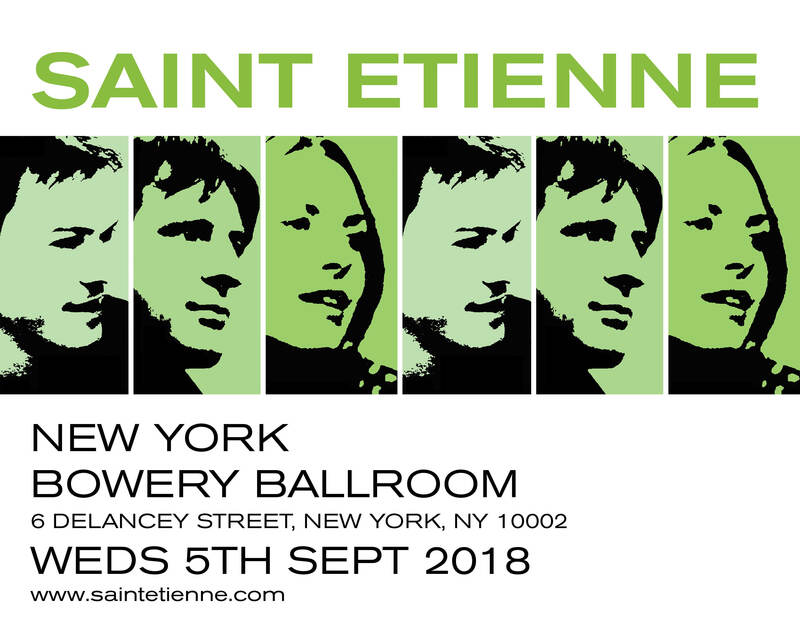 Saint Etienne celebrate 20 years of ‘Good Humor’ in New York! 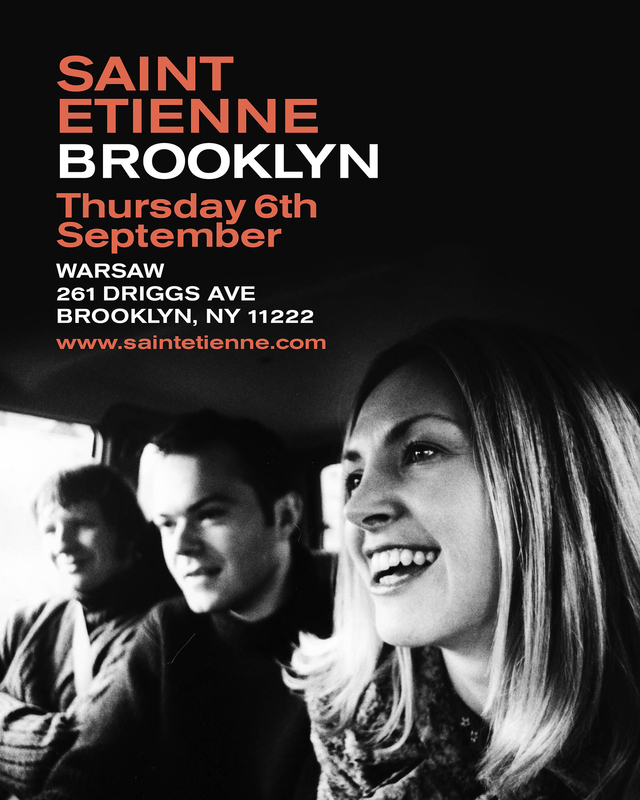 Saint Etienne celebrate 20 years of ‘Good Humor’ in Brooklyn! 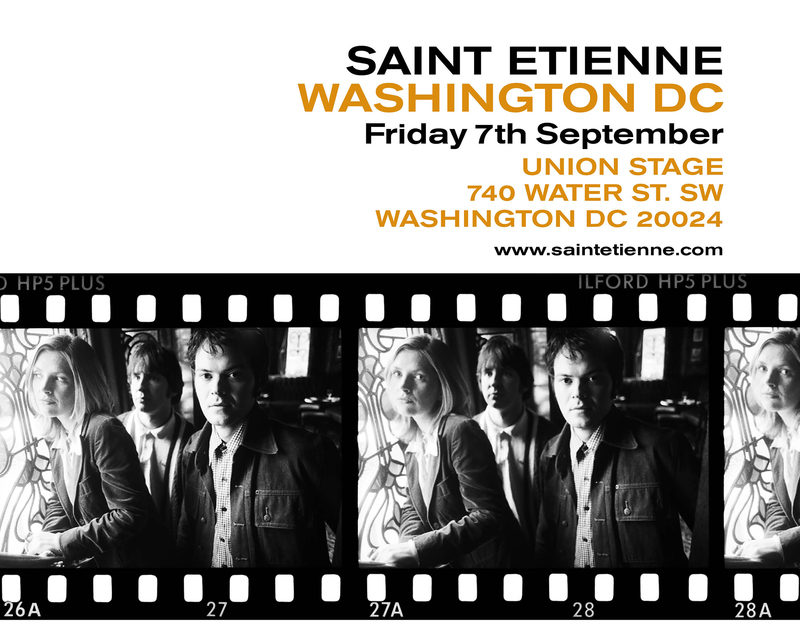 Saint Etienne celebrate 20 years of ‘Good Humor’ in Washington DC! 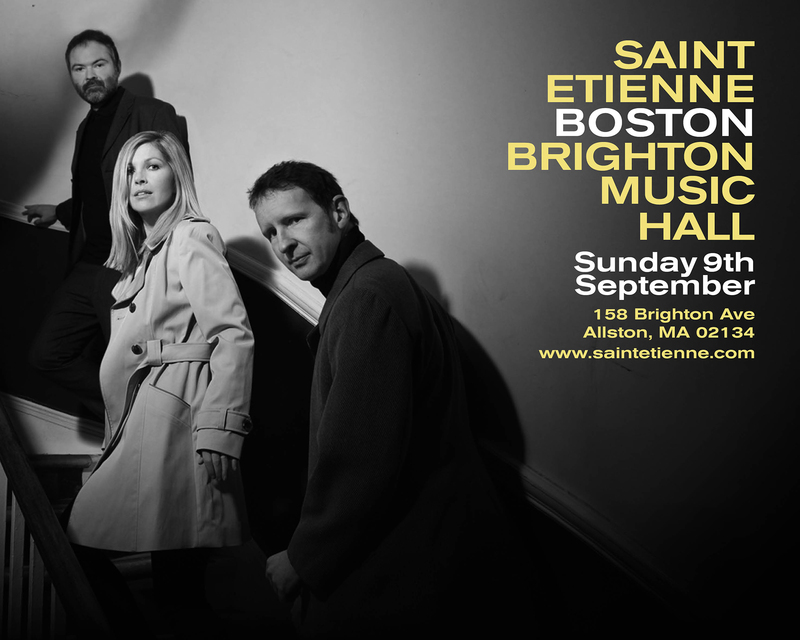 Saint Etienne celebrate 20 years of ‘Good Humor’ in Boston! Saint Etienne celebrate 20 years of ‘Good Humor’ in Montreal! 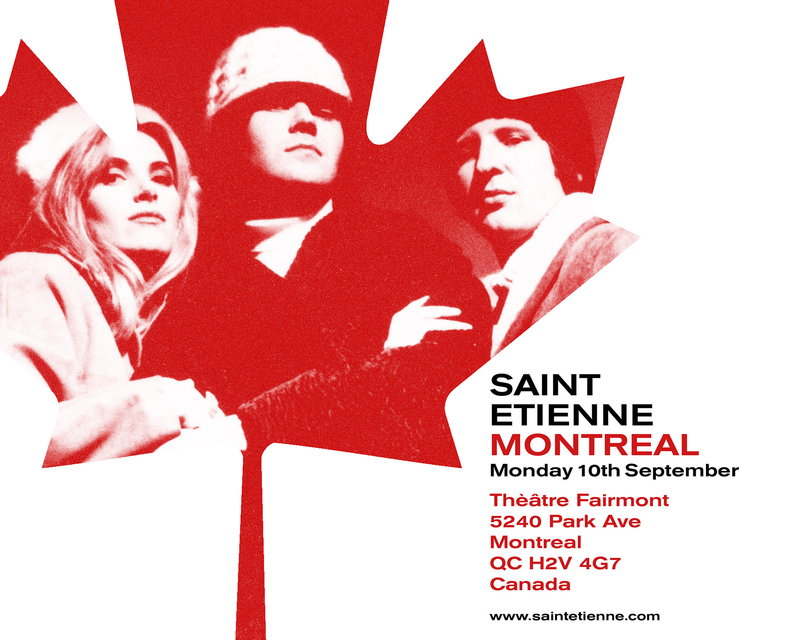 Saint Etienne celebrate 20 years of ‘Good Humor’ in Toronto! Saint Etienne celebrate 20 years of ‘Good Humor’ in Chicago! 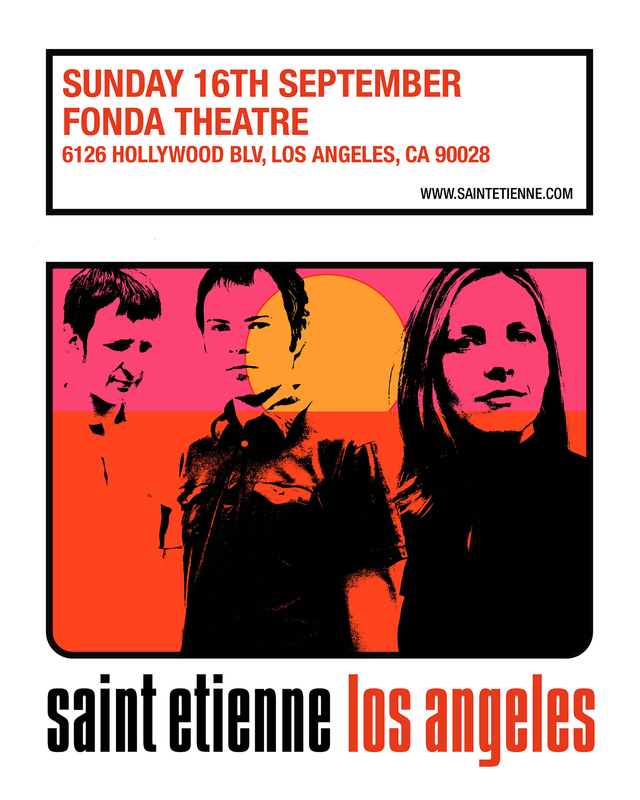 Saint Etienne celebrate 20 years of ‘Good Humor’ in Los Angeles! 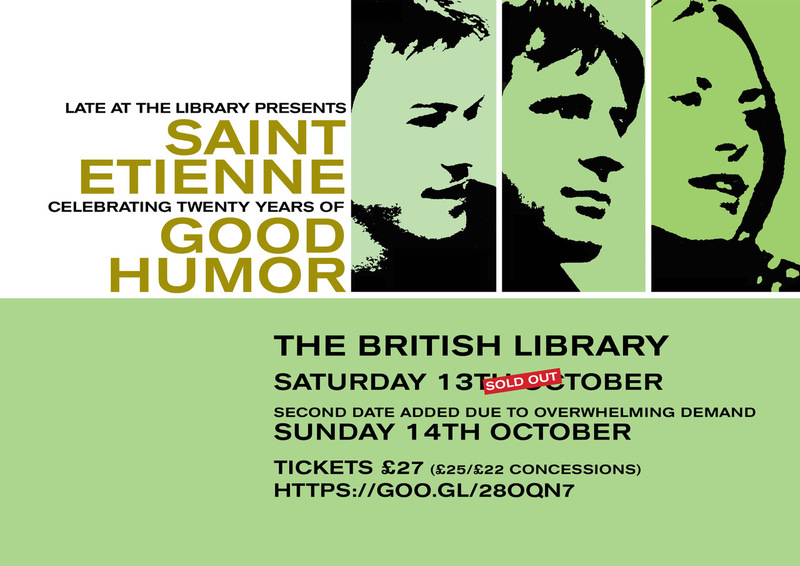 Saint Etienne celebrate 20 years of ‘Good Humor’ with two special shows at The British Library on the Euston Road in London. The band will perform their 1998 album ‘Good Humor’ in it’s entirety followed by a set of hits, misses, fan favourites and a new song or two. Lawrence (Felt, Denim, Go Kart Mozart) is special guest DJ for the evening. SOLD OUT – this event sold out in seconds flat please see ticket link for Sunday show. The first of our Christmas Parties is in Saltaire, Yorkshire (the other is in Brighton, Sussex on Dec 14th), in one of our favourite, wonderfully atmospheric social clubs. We’ll be playing records that were in Christmas Top 40s, but not necessarily Christmas records… cunning, eh? Also we’ll do our now-traditional raffle, with St Et rarities and egg nog up for grabs… plus everyone will get a special “prize” just for coming. Both nights start at 7.00pm and finish at 11.30pm. Tickets are strictly limited to 130 for each party. The second of our Christmas Parties is in Brighton, Sussex (the other is in Saltaire, Yorkshire on Dec 6th), in one of our favourite, wonderfully atmospheric social clubs. We’ll be playing records that were in Christmas Top 40s, but not necessarily Christmas records… cunning, eh? Also we’ll do our now-traditional raffle, with St Et rarities and egg nog up for grabs… plus everyone will get a special “prize” just for coming. Both nights start at 7.00pm and finish at 11.30pm. Tickets are strictly limited to 130 for each party.